Is the cocoon compatible with all kinds of coats? Yes, the cocoon is universal because it adapts equally well to coats and jackets with buttons, zips and other systems. How do you fit the cocoon? For subsequent fittings, since you already know the height at which the extension is to be attached, you can follow these steps while missing out steps 4 and 7 :). Can the cocoon be washed? The cocoon can be washed by hand or with the hand-wash cycle on your washing machine. It should not be tumble dried but should be left to air dry instead. No, it isn’t waterproof. We are always on the lookout for the ideal fabric that would meet our requirements (organic, natural) while being waterproof! So, this is only temporary. Up to what age can the cocoon be used for children? The cocoon can be used for babies/toddlers from birth until active walking (approximately 18 months). In fact, as soon as children start walking, they will want to get out of your sling or baby carrier, and get back in, often. From this point on, you will need to provide them with a coat. How much does the cocoon weigh? The cocoon weighs approximately 500 grams. Due to the presence of magnets, can you use the cocoon if you have a pacemaker? Magnets may interfere with the correct functioning of pacemakers and implantable defibrillators. If you wear such a device, keep a sufficient distance from magnets. Finally, keep the wearers of such devices away from magnets. 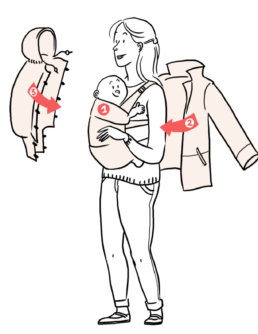 How should you dress your baby under the cocoon? While they are in a physiological position, all nice and warm in their slings or baby carriers, the cocoon enables you to avoid dressing babies or toddlers too much! Depending on the temperature, you can dress your baby as you would indoors and, for lower temperatures, use a good wool cardigan or a good fleece. The hood is not a substitute for a hat. It simply enables you to protect your child from light, cold or noise while they are sleeping. This also means that, when you go into a warmer place and your baby is sleeping, you do not have to undress and risk waking them. You can just open you coat or jacket at the extension!